This article is about an Australian film. For the horticultural use, see Berry. 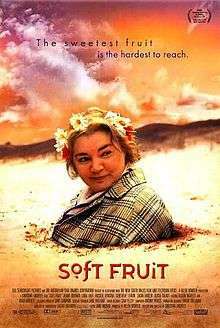 Soft Fruit is a 1999 drama about a dying mother, and her children who come together to fulfill her last wishes. It is an Australian American co-production produced by Australian filmmaker Jane Campion and directed by Christina Andreef. As you grow older, it's so difficult to stay in relationship with your adult brothers and sisters. When you get into your thirties and forties, paths are dividing. Soft Fruit is about that sibling struggle. You think you don't care when you have a fight and fall out. Someone is always on the outer. It's about that struggle to get back on the inner, on the inside. Soft Fruit grossed $598,704 at the box office in Australia,.